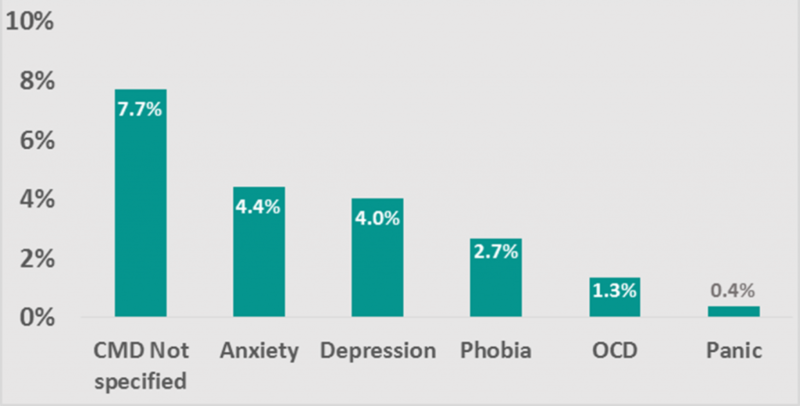 Around 42% the Wakefield population may have experienced a common mental health disorder (CMD) symptom at some point in their life according to the Adult Psychiatric Morbidity Survey 2014 (APMS 2014). 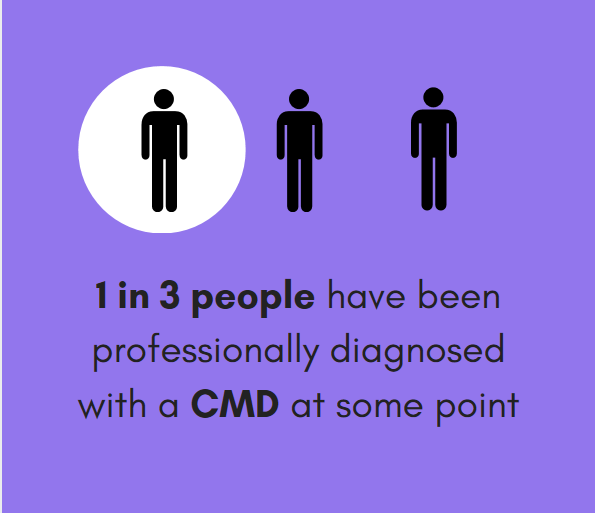 1 in 3 people (30%) in Wakefield report they have been diagnosed with a CMD at some point. 16% of people were identified as probably having a CMD at the time of the survey. The two most common CMDs in Wakefield are anxiety and depression, with 4.4% of the population being identified as probably experiencing anxiety, and 4.0% identified as experiencing a depressive episode at the time of the survey. More men (4.7%) than women (3.4%) were identified as having experienced a depressive episode. More than a third of people in Wakefield (35%) were identified as having had a spell of feeling sad, miserable or depressed in the past month. Almost half the population were identified as having any symptoms of a CMD (48%). 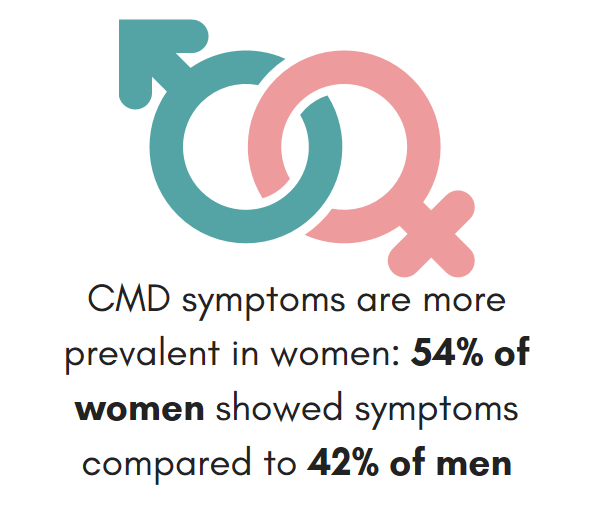 Prevalence of having any CMD symptoms is higher in women than men (54% of women compared to 42% of men). Around 60% of people who were identified as having CMD symptoms at the time of the survey were not receiving any form of treatment. There are inequalities in common mental health disorders, with high prevalence in people living in deprived areas (13.1%) compared to more affluent areas (7.9%). 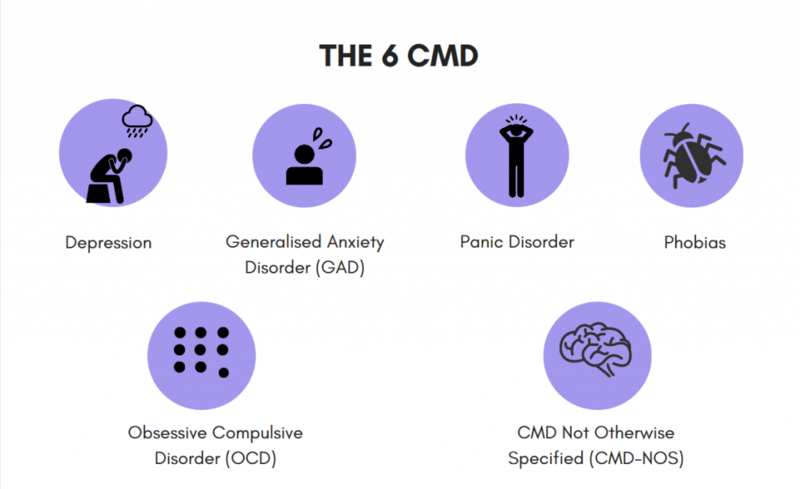 Common mental health disorders (CMD) are conditions that can affect the whole population. 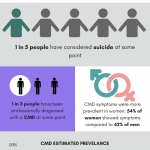 It’s estimated that 1 in 3 people (30%) in Wakefield have been diagnosed with a CMD at some point (APMS 2014). This data shows that almost half the population report they have experienced a common mental health disorder at some point in their life. The prevalence of CMD is estimated to be highest in those aged 25 to 55. CMDs affect both men and women but the prevalence of having any symptoms is higher in women (54%) than in men (41%), symptoms include fatigue, irritability, having depressive ideas, worry, panic, forgetfulness, sleep problems, worries about physical health, depression, anxiety, phobias, compulsions and obsessions. There are some common mental health disorders where men are more affected, such as experiencing a depressive episode (4.7% men, 3.4% women). In 2014 the Adult Psychiatric Morbidity Survey (APMS 2014) was completed, providing data on the prevalence of CMDs and some information about treatment in the adult population. An enhanced sample was surveyed in Wakefield and can be used to provide further information for our population. 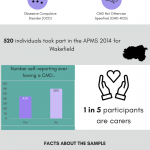 Two summary infographics are available to download, Wakefield APMS Sample Profile, Wakefield APMS Estimated Prevalence (you can print the image or right-click to save it). More information about the APMS Wakefield sample can be accessed here. This data shows that almost half the population report they have experienced a common mental health disorder at some point in their life, with around 30% reporting they have been professionally diagnosed with CMD at some point. CMD not specified indicates someone has a collection of CMD symptoms but they are not associated with any one specific CMD. Where data is available to show the burden of these symptoms in Wakefield it indicates that prevalence of depression is higher in Wakefield compared to the national average and other similar areas, and that it’s increasing. We have developed local estimates of depression prevalence, based on data from primary care systems, where a person has a diagnosis of depression. This allows us to look at the inequality of depression across different areas and age groups. Not everyone with depression will have been formally diagnosed, so these local figures should be used only as an estimate, but give us a good idea as to how depression prevalence varies within Wakefield district. The burden of depression is not equal in Wakefield; it’s estimated that people from poorer backgrounds are more likely to have depression. Depression also seems to be more prevalent in those aged between 25 and 55, although this may be because people in those age groups are more likely to visit their GP and be diagnosed. The interactive dashboards below shows estimated depression prevalence across different areas and ages. You can use the dashboard to select an area or age of interest, these are colour coded to easily show how that area compares to the Wakefield District average. Turning Point provides free Talking Therapy services to people with CMDs who are aged 18 years or older and are registered with a GP surgery in the Wakefield District. The service is delivered in partnership with NHS Wakefield Clinical Commissioning Group.